An investigation has been launched after two horses died in the paddock at Newbury amid fears they were electrocuted by underground cabling. Fenix Two and Marching Song were due to feature in the day's opening race but collapsed. Another horse, Kid Cassidy, was withdrawn after stumbling. The Merry Giant was affected but took part in the race, finishing last and said to be "badly traumatised". Seven horses made it to the start but the last six races were abandoned. Marching Song's trainer Andy Turnell said: "He went straight down. It looks like they've been electrocuted." Trainer Nicky Henderson was quick to pull out his runner Kid Cassidy, but the novice hurdle race went ahead, more than 20 minutes late, and with three of the original 10 runners missing. It was won by Paul Nicholls' Al Ferof. Racegoers saw no further racing, and organisers announced later in the day that they would be fully reimbursed. The British Horseracing Authority is investigating as is the Southern Electric Power Distribution and the police. 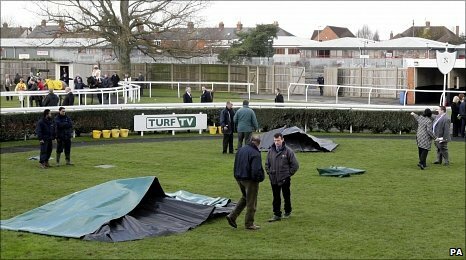 A racecourse spokeswoman confirmed a cable, thought to be dormant, had been found under the paddock. She added: "We cannot confirm if that definitely was the reason for the incident today." At 2200 GMT, the BBC's racing correspondent Cornelius Lysaght tweeted: "Extensive 'excavations' on paddock at Newbury continuing says course & more to be revealed later." Horses are far more sensitive to electricity than humans, and wet ground conditions could have contributed to the fatal accident. Henderson said: "About a minute before it happened, Kid Cassidy was walking in the same corner of the paddock. I had my back turned but my daughter said 'your horse has gone down'. "He got back up again and he went to the start. All the horses at the start had their hearts checked and he was fine, but he was desperately keen so I decided to take him out. "Electrocution is the most obvious possibility. Nobody is to blame really, but I think you'd only really find out when they've done a post-mortem. "The worse thing is what happened to the horses and it's all very odd." Jonjo O'Neill, trainer of Fenix Two, said: "Kid Cassidy was in front and he took a turn. "We thought he was bucking and kicking and he went down on his knees then he seemed to be OK.
"Mine reared up and we couldn't get him back, it was like he was stuck to the ground. It was the weirdest thing I've ever seen in my life." Al Ferof's owner Paul Barber was in the paddock and said: "The girl [leading] Turnell's said she felt a tingling as she led them round and then Nicky's horse went down. "They were getting the shocks off the grass, not off the tarmac. I've never seen anything quite like that ever." Stipendiary steward Paul Barton said: "We are going to hold an inquiry and interview those connected with the horses." Asked about rumours that a lead rein on one of the dead horses looked burned, Barton said: "One of the reasons we couldn't continue was because of all the speculation. "The rein will go away for forensic examination to establish what happened to it." Representing The Merry Giant's trainer Rebecca Curtis was her partner Gearoid Costello, who said: "He's badly traumatised and the vets are monitoring him. The horse went down on his hind legs in the paddock but went down to the start. I asked to take him out, but the vets said he was OK. However, I regret running him. "The chain on his lead rein broke, but it wasn't scorched." Newbury chairman Christopher Spence said: "It's a nightmare for everybody. We can't be certain what it is, we all think it's electric, but we don't know. "It's easy to say carry on and hope for the best, but just hoping is not something we should or could do. We've got to look after our customers and we've got to look after the horses, so very regrettably we've called the meeting off. "It's defeated everyone and we don't know the answer. We'll have a meeting to decide if we can re-run any of the races and we'll make further announcements as soon as we possibly can. "We've looked at the cables and we couldn't see any damage and no work has been carried out on the paddock since the last meeting." The second race was due to be screened live on Channel 4 but at 1410 GMT a decision was made to call off racing at the 104-year-old course. 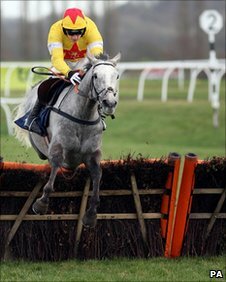 Fenix Two was an unraced six-year-old owned by JP McManus, the employer of champion jockey Tony McCoy. Marching Song, a five-year-old, had raced eight times in all and twice over hurdles. While a number of trainers urged Newbury to re-arrange the abandoned six races with the Cheltenham Festival fast approaching, at Warwick Finian's Rainbow notched an important win. The 2-5 favourite did not jump with much fluency in the early stages of the Kingmaker Novices' Chase and most bookmakers left the Arkle favourite unchanged at 7-2 in ante-post markets.